Non-fiction – paperback; Lilliput Press; 244 pages; 2010. Trevor White was just 28 when he decided to set up his own magazine in his home town of Dublin, Ireland. He’d just spent two years “working in the publishing arm of the luxury goods industry” in New York and was keen to return home. ‘The Dubliner’ will be the definitive guide to life in Ireland’s capital. The cover price will be £2.50 and the average circulation will be 20,000 copies. The magazine will be read by urbane, well-educated men and women. Handsome design and sound advice will appeal to readers who have abandoned the search for a savvy take on life in Dublin. In short, the magazine will animate the city’s conversation. This is where I confess that prior to picking up The Dubliner Diaries in a bookshop (it was the cover that drew me to it, how can one resist a moist-eyed baby tiger staring up at you from a display table? ), I had never heard of (1) Trevor White and (2) The Dubliner magazine. But it seems that for a short time — well, seven years actually — Mr White and his monthly title were very well known, and much despised, in Dublin. Initially it would appear that White wasn’t particularly popular, probably because he wasn’t a local boy made good, but because he was local rich boy — and a Jewish one at that — with upper-class connections and, dare one say it, pretensions. But later on it seems as if he could not put a foot right: circulation never increased beyond the first issue’s 8,312, opinion in the press wavered from scorn to downright hatred, and several legal wrangles mired White in difficulty — and embarrassment. What makes The Dubliner Diaries such a great read is that White never shies away from being completely honest with himself — he uses a rather endearing self-deprecating tone throughout, as if he is very much aware of how pompous and narcissistic he might sound otherwise. But, to be fair, he never makes excuses and always acknowledges when he’s done wrong. He even goes so far as to say that publishing is one giant learning curve, where it’s vital to learn from your mistakes. Of course, there’s plenty of shameless name-dropping, and in a small city like Dublin I suppose it’s hard not to run into — and hang out with — the likes of Bono, John Banville, Gavin Friday and media mogul Gavin O’Reilly. And there’s plenty of man-about-town shenanigans — launch parties, press bashes, celebrity dinners, lots of drinks in the Shelbourne — that provides a fascinating glimpse into a world few of us would ever get to experience. Ownership of a mansion to a new mobile phone to the latest line in trainers will help to assign you a position in the pecking order. The city has become like an American goldrush town where whoever held the biggest lump of shiny metal suddenly found himself the most popular man in the bar; the fact that his language was crude, his education minimal and his face dirty counted for nothing. I’m not sure The Dublin Diaries will attract much interest beyond Irish shores, but if you admire people gutsy enough to follow a dream or are fascinated by the inner workings of the magazine trade, an industry which is in terminal decline, then there’s plenty to like here. I found it an enjoyable read and got a few giggles out of it. I especially enjoyed the way in which he continually cut the over-inflated egos of so-called “celebrity chefs” down to size! 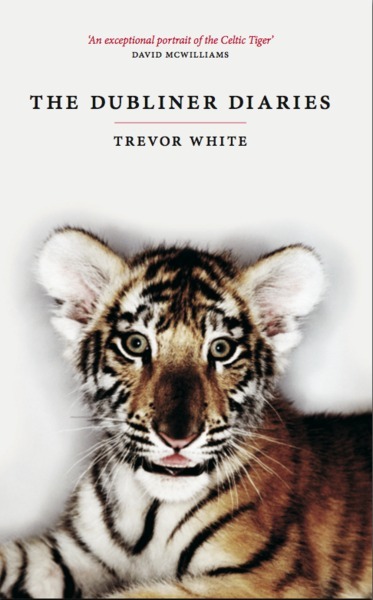 I love the cover too – is there a reason why it features a tiger cub, or is it just the buy-me-‘cos-I’m-cute factor? I think it is supposed to represent the Celtic Tiger — before it got mauled. LOL.